Antivirus 7 is fake computer security program that comes from the same nest as Antivir, Antivir Antivirus and Antivirus 2010. This rogue has a simple design and tries to pass for a reliable antivirus application, but it is very far from the truth. Antivirus 7 has been designed to look reliable and lure the hard-earned money from unsuspecting computer users worldwide. If you are not careful about it, you can end up being robbed as well, so you must deal with Antivirus 7 once you notice this threat raging in your computer. Usually, this rogue is distributed via fake online malware scanner websites. In turn, these websites are promoted through various pop ups that assault you while you browse random websites of dubious content. If you click on these messages, you are forcefully redirected to the scanner website where you are urged to perform a “scan”, because a “suspicious activity” has been detected in your computer. You should NOT do that. However, if you do, once you click on the scan, you automatically initiate the download of Antivirus 7. No download window appears, so this rogue enters your system without your permission. These messages are just as good as their spelling. This onslaught of security related notifications is generated in order to convince you to pay for the Antivirus 7’s license, however, if you pay for it, your money will be lost for good, and the rogue will remain in your system, damaging it further on. 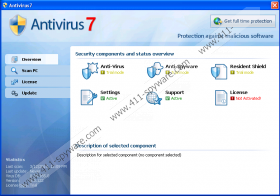 If you do not know how to terminate this infection manually, get yourself a reliable antimalware tool that will remove Antivirus 7 automatically for you in no time. You should not hesitate when your computer’s security is as risk. Not to mention that this rogue wants to rip you off. Show no mercy to Antivirus 7 and deal with it as soon as possible.